Lake Issaqueena is separated from its larger and more popular neighbor, Lake Hartwell, by the Issaqueena Dam, which crosses Wildcat Creek in the Clemson Experimental Forest, a 17,500-acre education and research reserve. During the New Deal, roughly 30,000 acres of degraded and abandoned farmland surrounding Clemson College (now Clemson University) were purchased by the United States government. 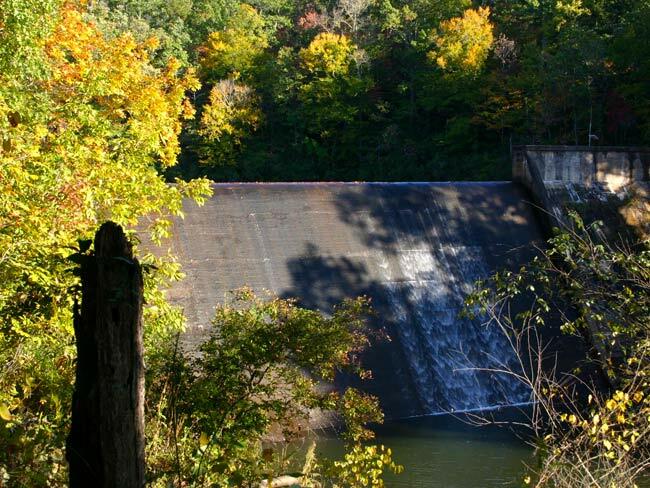 In 1934, the Works Progress Administration constructed the Issaqueena Dam and began a general reclamation of the area – planting new trees, stabilizing irrigation, building recreational facilities, and more. In 1939, management of the land was taken over by Clemson, and the school, the United States Department of Agriculture, and the United States War Department reached an agreement allowing the area around the lake to be used for target practice. By 1942, Lake Issaqueena and its surroundings had become known as the Issaqueena Bombing Range. Around 4,000 acres were used for training flight crews during World War II from the Greenville Army Air Base, now called Donaldson Air Force Base. The range became a significant training ground after the attack on Pearl Harbor. When the lake was partially drained in 1954 for ecological restoration, thousands of sand-filled M38A2 practice bombs dropped by MB-25s Mitchell bombers were discovered. While they were disposed of the following year, the lake had not been completely drained, leaving the possibility of more practice bombs lying on the lake floor. A site investigation was conducted by the United States Army Corps of Engineers in 2006; after that inspection, the lake was deemed safe. A Clemson University student tradition has been sliding down the dam and swinging from a rope into the lake, despite posted warnings against both activities. The South Carolina Department of Natural Resources cut down the rope swing several times, though it would soon be replaced, presumably by students. Finally, the DNR cut the tree down after a student drowned. The tree’s stump and a platform used by people swinging into the lake remain. An iron fence to deter dangerous behavior was erected on either side of the dam in 2009. We recently visited SC and were hoping to locate waterfalls. After getting to three or four parks successfully, we were puzzled not to find signs directing us to waterfalls and other attractions. The entrances to parks were signed okay but within the park we were unable to locate areas. The falls at Greenville were great, and we were able to find our way around easily. We will be back and hope to be able to locate some of the waterfalls and attractions better. We enjoyed the SC gardens at Clemson. Beautiful. Hope to see you soon. Consider as a historical research hypothesis: The possibility that the “vandalism” that destroyed the bath house, boat house and other facilities near the near west end of Issaqueena Lake Road was actually an “accidental” result of the practice bombing on Lake Issaqueena during during World War II. Hi, Gene. I have included a map on the page as well as the road that leads to the dam and lake. I hope this helps! I also included a website for the trail. Best of lucK! I wished someone would tell me how to get to Issaqueena Lake from Anderson (route 76). The directions recently given in a South Carolina Wildlife magazine story are, at best, confusing, or outright wrong.